Thanks to you who have had the perseverance to follow this long blog string on “Future Church, Future Bible.” Let me briefly recapitulate the previous posts. After a time, the authority of Scripture was muted or inaccessible to most people in the church, especially in Western Europe (the primary source of American Evangelicalism). Martin Luther changed this by beginning to study Scripture in the original languages in a somewhat historical and critical way. Luther often took into account the context and intent of the original authors. He also translated Scripture into the language of his people, the German-text “Luther Bible.” Many scholars believe that Luther transferred the authority within the church from the Roman Catholic curia of his day to the Bible, but what he really accomplished was moving the authority for interpretation from the trained and authorized (and sometimes ruthlessly corrupt) teachers of the Roman church to the individual believer. Lutherism, when understood this way, was less a move away from a corrupt church to establish a biblical church as it was a move away from a unified church to a church reduced to the individual. This was the key to the rise of Protestantism in Europe. It eventually unleashed generations of learned people who studied the Bible using the best scholarly techniques and resources available to them in their day. In the 500 years since Luther, several things have happened. One was the move away from a single church with its highly organized government (hierarchy) and political power (“Christendom”). This had unintended consequences. The Bible had become a tool of authority for the individual believer. New churches were organized around dynamic leaders and these churches adopted their leaders’ interpretations of key Bible texts. No mechanism existed to prevent further divisions within the church. The result was a multitude of distinct churches, most of which recognized the Bible as authoritative, but with different results based on culture and interpretations of this book. Practical unity in the church was confined to the congregational level, and even there, restless or dissatisfied members could hop from church to church until they found a congregation they personally judged to be adequate. This is still the case in the evangelical church today. Also, two great trends within the tradition that became Evangelicalism were nurtured and grew. The first of these trends was the desire to systematize the teachings of the Bible into a coherent grid. This was not new, but was undertaken with greater emphasis and exclusivity where the Bible was concerned. The great systematic theologians worked to define the major themes of the Christian faith (Theology, Christology, Soteriology, etc.) and mine the Bible to find the gems of texts that spoke on each topic. The systematician then synthesized these texts into unified statements of doctrine. The second trend that eventually ran afoul of this systematics work was the progressive development of biblical interpretation itself. A tradition of scholarship arose that began to take the Bible seriously as a collection of documents written within identifiable historical and cultural contexts. Left behind were naïve understandings that treated the narratives of the Bible as stories about semi-fictional or mythological characters unlike the modern readers. Also left behind were the allegorical readings of many texts, the move that made the Bible ahistorical and washed away difficult things by seeing them as symbolic. The interpretation of the Bible became a rigorous discipline, some would say a science, that had clear rules based on the analysis of ancient literature in general. In the mid-twentieth century, these two trends were primed for a collision. Whether entirely aware of it or not, evangelical scholars had always been influenced by their systematic presuppositions when interpreting the Bible. Nowhere is this seen more clearly than in the principle of the evangelical “analogy of faith,” the idea that all readings of Scripture must fit into the larger grid of what the church has taught historically. This amounted to the triumph of systematicians over biblical interpreters and is still the case within evangelical scholars today (as witnessed by many of the papers read at the Evangelical Theological Society). We should not be surprised by this. Luther shifted authority from the hierarchical teachers of the church to the individual, thereby resulting in semi-biblical conclusions driven by theological and doctrinal presuppositions. This was somewhat inevitable, I think. What has called this into question is the rise of literary criticism in a larger sense in the mid-twentieth century. There were many parts to this: the “hermeneutics of suspicion,” “literary deconstruction,” “reader-based interpretation,” and others. But one positive result was to expose the fallacy of reading and interpreting any text without presuppositions. There was no tabla rasa, no blank slate for any human interpreter. We all come to the text with preunderstandings. For evangelicals, this includes the systematic truths drilled into them as doctrines. But does the Bible determine our doctrines, or do the doctrines control our reading? For me, Easter Sunday is the most significant celebration of the year. It brings together everything that makes us Christians: faith, hope, and love. In the time of Jesus, Jerusalem was considered to be the holiest city in the world. It was the location of the Jewish temple, but it fascinated Romans and Greeks. It had been rebuilt, starting with King Herod, and the lavish scale and costly accouterments would astound us, even today. The temple was one of the grandest buildings of the ancient world, and would surely have been on Herodotus’ list of the Seven Wonders if it had existed in his day. The temple was made to be the focal point of grand festivals, much beloved by the Jewish people. It had a spacious courtyard and covered porticoes, capable of holding hundreds of thousands of pilgrims for the festivals. Raising suitable lambs and having them available for sale was big business in those days for the villages surrounding Jerusalem (including the shepherds of Bethlehem). It was like the Christmas season for merchants today, they could make a year’s income in a few days. There was one special lamb, though. On the 10th of Nisan, the High Priest would go outside the city to a lamb seller and choose a perfect lamb to be the Lamb of Israel. One tradition says that this lamb was led by the High Priest into the city in great ceremony, with pilgrims lining the streets, singing, shouting, and waving palm branches in worship. Traditionally, they sang the lines of Psalm 118, “Blessed is he that comes in the name of the Lord.” This Lamb for Israel would be penned within the Temple courts, and during the week of Passover, all the visitors in town could go and view it. It had a huge role as a “celebrity” lamb, scheduled to die by the hand of the High Priest. On the week of Jesus’ death, he ate a Passover meal with his disciples on Thursday night, a meal he modified to become our basis for the Lord’s Supper. He went to the Garden of Gethsemane to pray, and there Judas, the betrayer, led a squad of temple police and other rabble to arrest him. Jesus was seized, and given a series of trials. He was condemned and led to the place of the Skull, and there he was crucified. His nailing to the cross took place about 9:00 a.m. on Friday morning. At about the same time, there was a small group of Jesus’ disciples who gathered around his cross on a hill called Calvary. They had witnessed Jesus’ agony on this evil tree for about six hours. Then, about 3 in the afternoon, Jesus raised himself one last time and wheezed, “It is finished.” The perfect Lamb of God had been slain, not just for Israel, but for the sins of the world. Jesus statement meant both that death had come and that his mission of atoning sacrifice had been accomplished. But it was not the end. Jesus died, and was buried, but on the following Sunday, God raised him from the dead. He who was dead lived again. Death had not won and our world will never be the same. It is not finished. Celebrating the Resurrection means it is only beginning. First: the institutions of the Restoration Movement are undergoing massive shifts and changes. Second: the Restoration Movement is becoming less about principles and more about people. My third observation is: the people of the Restoration Movement will be important players in the new movement for a unified church. What, you say, there is a new movement for a unified church? You hadn’t heard about it? In 1959, James Robinson published A New Quest for the Historical Jesus. Robinson noted that the “quest” had been revived and had shifted from a rigorous historical investigation to one based on the philosophical driver of the day, existentialism. This is not the place to trace the developments of this second quest, but simply to say it quickly reached dead ends (or drove over cliffs, depending on your chosen metaphor). In 1993, an evangelical British scholar, N.T. Wright, announced that a “Third Quest” had begun, what I remember hearing described as the “New New Quest for the Historical Jesus.” This time, conservative and not-so-conservative scholars plunged headlong into analyzing and debating every piece of evidence about Jesus and his world, both from the Bible and other ancient sources. The results were things like Wright’s colossal series, Christian Origins and the Question of God, now at four volumes out of a projected six. The second volume, Jesus and the Victory of God is a hefty 700 pages and is the epitome of this third quest, exploring every possible avenue to recover the best and most accurate picture of the man, Jesus. Three quests pursuing the historical Jesus, all having the same goal but different presuppositions and results. Each was a product of its historical context. The Restoration Movement as envisaged by the Campbells and Barton Stone was a quest for Christian unity. They saw this as possible if Christians would abandon divisive creedalism and look to the Bible as the sole source of doctrine. However, even among the ranks of their immediate followers, complete consensus concerning the doctrines of the Bible was never reached. Alexander Campbell and Barton Stone themselves disagreed over something as central as the nature of God, Stone being semi-Arian and Campbell being clearly Trinitarian. Yet they agreed in principle to cooperate and have their churches be united. After their passing, the movement was split over things that seem almost comic in retrospect. Using pianos in worship? Paying ministers? Observers of the Restoration Movement in the first half of the twentieth century must have been amazed the a unity movement had so many hard-line sectarians. In the 1980s and 1990s, there was a second quest for unity. This seemed to be motivated partly out of the dismay that the Restoration Movement had splintered so badly and needed to restore its own unity if it had any hope of being an example to the church at large. Several things happened, including the founding of the Stone Campbell Journal, a publication that had writers from all three branches of the movement. But while on a scholarly level the SCJ was a success, the churches were still separated. Perhaps they had lived apart for too long, a little like childhood friends reunited in old age who have little in common but distant memories. I think there is now a third quest for Christian unity underway and it has little to do with the Restoration Movement. The sectarianism that has so permeated the church in America for 300 years makes little sense to many today. The megachurch phenomenon has congregated Christians of many backgrounds served by pastors with equally diverse educations and experiences. As I have said for twenty years, it is not about doctrine anymore and certainly not about doctrinal warfare. There are a few essentials: the authority and value of the Bible, the divinity of Christ, and the necessity of faith for a saving relationship with God. But no one wants to fight over premillennialism anymore. There is a growing sense that Christians should be active agents for good in their communities, far beyond just inviting people to Sunday services. If the church is to matter to the next generation, it must do things that matter. Social justice is high on the agenda of the millennial generation, and this will not go away. I believe the churches and the leaders of the Restoration Movement are poised and able to make a substantial contribution to this new quest for unity. Can we truly be Christians only again? Can we quit drawing lines that divide and find reasons to unite with other Christians? There are some big issues here, and they are found throughout the evangelical community. Can we quit treating Catholics as sub-Christian enemies? Can we leave our right-wing or left-wing politics at home and no longer let our churches be political tools? Can we finally banish racism from our churches and accept people of all skin colors and ethnicities as brothers and sisters, even as church leaders? The result of this may be that the Restoration Movement becomes a footnote in church history books. But it may be that its influence will be evident in a more unified church for the next century. That would be a good outcome, I think. The Christian Standard just released an article I wrote for them, “The Honest Poet.” If you are interested, here is the Link. The last part of Luke 10 continues the story of Jesus’ Journey to Jerusalem. The narrator tells us that “Jesus and his disciples were on their way,” the final walk to the holy, fateful, temple city of Jerusalem. In these meditations for Lent, we are over half-way there as we follow our Lord to the cross. Let us look at the story Luke tells about Mary and Martha. The story shows us that Luke’s material is stylized and topical, not a linear presentation of events in chronological order. We say this because the village of Mary and Martha was Bethany, just a few hundred yards from the gates of the temple in Jerusalem (John 11:1). Luke still has over eight chapters of material to relate, not reaching Jerusalem until chapter 19, but this is the story he wants to tell us now. The incident is familiar to us. Jesus and his troop show up at the home of Martha. It feels like a place they have been here before, a welcome place. Martha immediately begins arrangements for a festive meal, a fitting reception for her friend and Lord. While things are being prepared, Jesus is talking and teaching, and we can imagine a small crowd of disciples, villagers, and other pilgrims on the way to Jerusalem. Among them is Martha’s sister, Mary. 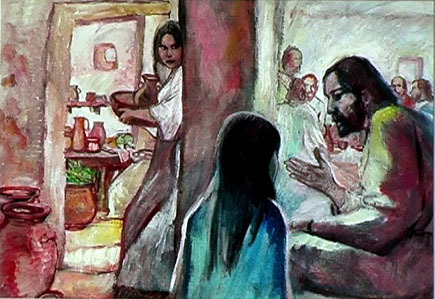 Martha’s hospitable and niceness persona is dropped temporarily, and she goes and complains to Jesus that Mary should be helping her, not sitting to listen to Jesus. We can imagine that tempers have flared a bit and the atmosphere of accusation and shame is strong in the room (or, more likely, the courtyard of the home). My sister has left me to do the work by myself. How often have you felt that way? How often, in church work, have you felt that many are receiving and few are giving? How often have you felt that you are going it alone, just you and Jesus, and no one quite understands how lonely your journey is? In this Lenten season, let us each make our way to the cross to celebrate Jesus’ great sacrifice for us. We must sacrifice, too, and there will be days when we feel we have been left to do a mountain of tasks of ministry all by ourselves. You need help, and there seems to be no help to be found. Yet we know this is not true. It is not just you and your imaginary friend Jesus laboring in ministry. First, he is not an imaginary friend. He is a real presence in the lives of his disciples. Second, you are not alone. Look around. The road to the cross is full of pilgrims. Some are happy and have a bounce in their step. Some are sad and walk slowly. Some are even disabled, and are being pushed by another. Yet we are not alone. When we feel the Martha blues coming on us, let us stop, and give thanks for the companions we have on the way. The media world has been abuzz for the last couple weeks about that villain of the world, Donald Sterling. A media outlet that lacks any filter (TMZ) released the recording of a phone call between the octogenarian Sterling and his 20-something girlfriend in which he made racist comments. He was quickly banned by the National Basketball Association for life, fined $2.5M, and threatened that he must sell his team, the L.A. Clippers. I have no desire to defend Sterling, a businessman of less-than sterling reputation in Los Angeles. The whispers of his racially insensitive talk and actions have fueled the Los Angeles media for years, so while the legality of making this private conversation public is questionable, the verdict on Sterling as a racist is deserved. The whole Sterling circus has reopened the discussion of racism in America, and I am deeply troubled by the reality that pokes through when this debate resurfaces from time to time. Kareem Abdul-Jabbar said yesterday that “more whites believe in ghosts than they do in racism.” His implication is that people like me think that racism in America is long-gone, a battle done. I wish that were true. How many other Donald Sterlings are out there? By this I mean white people who do not act as racists publicly, but talk that way in private conversations. I wonder if this could be said of the American church? Perhaps we are not a church of racists, but a church with many racist members who are tolerated. I don’t want to generalize, but I have too often been around white Christian church leaders who think nothing of dropping a mildly racist comment or telling a quasi-racist joke. Recently, in Nepal of all places, I heard a white evangelical minister from Texas tell a “joke” that denigrated President Obama and his ethnic background. (BTW: I heard in the 2012 election an estimate that 25% of white Americans would never vote for Obama simply because he was a black man.) So if we believe racism in America is a problem solved, I assure you it is not. The ancient church was challenged by a different kind of racism. It was made up of Jews and non-Jews (Gentiles). Jews were a substantial minority of the Roman empire’s population, maybe 10% by some estimates. They were influential in the Roman world, yet they were despised by the Romans. This led to a strange mix of persecution complex combined with proud ethnic elitism for the Jews. It was very difficult for them to accept non-Jews into the church at first. Such folks were both their tormentors and their inferiors, the Jews believed. But Paul would have none of this. He taught there was no distinction between Jew or Gentile in the church, all were one in Christ (Galatians 3:28). Can we recover this in the church today? If we truly believed we were all one in Christ, racism would have no toehold on which to stand. 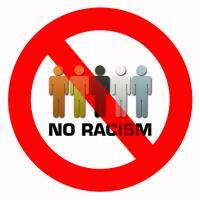 If we refused to allow ethnic distinctions to influence our thinking, racism would die a lonely and deserved death. The church of all places should neither be racist nor a place with racists as leaders. I have recently returned from nearly two weeks in Nepal. It is a country in transition, moving from a monarchy to some type of parliamentary republic. Most of the royal family was assassinated in 2001 (thus effectively ending the kingdom phase) but the new constitution is still being negotiated (thus making the eventual shape of the parliament unsettled). I think the country is in transition religiously, too. It currently has the largest percentage of Hindu adherents of any nation in the world (over 80%), but Christianity is strong and growing. As in Myanmar, the actual percentage of Christians is understated for political reasons, but may be approaching 5%. 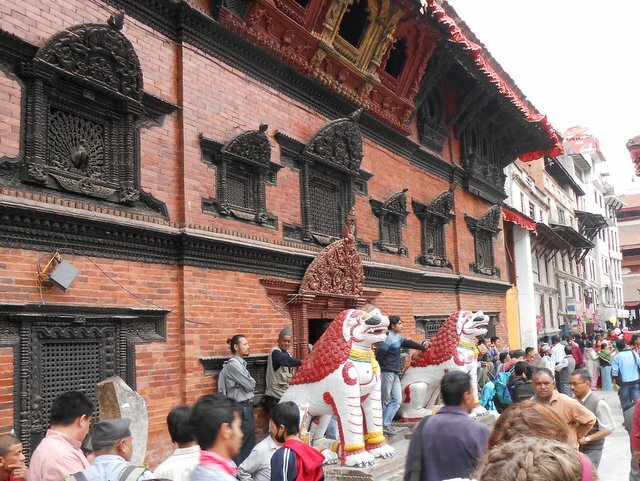 While we were there, we visited the historic district in Kathmandu that contains many Hindu temples and shrines. One of these was the palace where the Kumari lives, a young girl who is worshiped as a living goddess by the Hindus of Nepal. This girl was chosen from a group of candidates when she was age 4. She had to pass rigorous tests including spending a night in darkness in a room full of blood and sacrificed animals. If she cried or screamed, she was disqualified. She will remain the object of worship until she begins to menstruate, a time when it is believed the spirit of the goddess leaves the girl’s body. All of this is based on the concept of reincarnation, the idea that divine or human spirits migrate to different bodies over the ages. This is the great hope of Hinduism, to be reincarnated at a higher level as a reward for a holy or virtuous life. Christianity believes in resurrection, not reincarnation. Today, Easter Sunday, is the great celebration of the doctrine of resurrection, because it remembers Jesus Christ’s rising from the dead. Jesus was a man unjustly killed by the ancient Romans, his dead body laid in a tomb carved out of the limestone formations outside of Jerusalem. He was truly dead, stone cold dead and buried. But on the third day, Sunday morning, he came back from the dead. He appeared in his resurrection body. He was not reincarnated into a different body. It was the same one. He showed the scars of his crucifixion wounds as signs of identity to his incredulous disciples. He was risen from the dead. The Hindus have no such hope. We also visited the crematorium area of Kathmandu, perhaps the most terrifyingly depressing place I have ever been in my life. Here the bodies of beloved dead are burned with great ceremony and pomp, and the ashes are spread on the waters of a river. The soul is released to begin its uncertain journey of reincarnation. There is the possibility that the future will not be better, but worse if the soul comes back in a lower caste. We witnessed an extremely low caste man who was tasked with trying to salvage scraps of usable wood for burning from the fires of cremation. Imagine the degradation here: heating a home with charred wood scraps that had been used to burn a human body. Resurrection offers hope. This life is not the end, nor is it the greatest good. We have been given hope through the resurrection of Jesus Christ that transcends our current troubles and pains. We look forward to the time when we will join him in glory. This is more than speculation or legend. We have the confirmation of resurrection through the raising of Jesus from the dead. The son who was dead is now alive, and he lives forevermore! He is Risen! He is Risen! He is Risen Indeed!